I have my patterned paper, card-stock, stickers, embellishments, and tools to create scrapbook pages on my dedicated scrap table. These tangible supplies are fun, but technology has made its way into scrapbooking just like almost every other aspect of our lives. 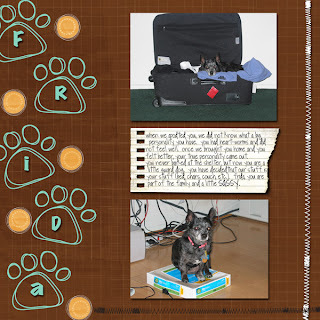 Last fall I bought a CD-Rom Scrapbooking Kit to help me start digital scrapbooking. 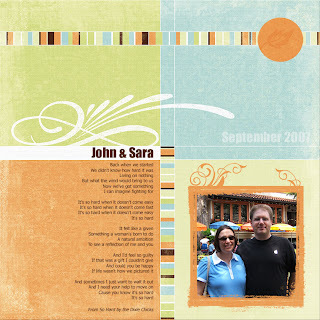 Digital scrapbooking is all done on a computer with a photo editing program such as Photoshop Elements. All the paper and embellishments I use on my traditional pages seem to have a digital version. I made one page last fall with the step-by-step instructions, but since then I have been mostly frustrated with Photoshop Elements. With John's help, I have been able to get over that hurdle. I finished two more digital layouts today. 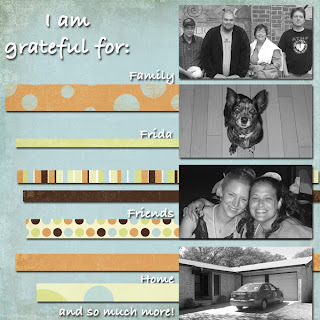 The next test will be to have the layouts printed in a 12x12 size to go in my scrapbooks. Scrapbook Pictures seems to have the best deal so far, and I am curious to see how these look in print. My plan is to do a mix of traditional, hybrid (both paper and digital elements), and digital scrapping. Happy retreat day! Twice a year we have a retreat for my office, which is a great opportunity for team building and a lot of fun. I listened to an entire audiobook today while cleaning out our filing cabinet. (It was 3.7 hours.) The book was Total Money Makeover by Dave Ramsey. My overall response is WOW! I have listened to podcasts of his radio show for a few weeks now but did not get all of people yelling "I'm debt free." I borrowed the audiobook from my library and really got into it today. It has concrete steps and straightforward advice. I highly recommend it but know that it will not be easy to follow his "baby steps." He calls them baby steps, but they really do require a big change. I've gotten excited about other books, such as You on a Diet. The books help me make some changes in my life, but once the excitement wears off, it is hard to keep up with the changes. Will this book be different? Eager to begin my high school career, I took World History I in summer school before my ninth grade year. I do not remember the name of the teacher, but he was a young guy right out of college. One of his friends gave a speech where he said "Patience is a virtue", and then just stood in front of the class. For some reason I remember this story, but I do not remember how it related to my class. Anyway, I found my ipod. I looked in my carry on bag one more time. It paid off to be patient instead of going shopping for a new one. Added Note: Thanks to Beth's good memory, I now know that the summer school teacher was Mr. Grafflin. I have this poem up on my bulletin board at work, but I had forgotten about it until recently. (A presenter handed out laminated copies at a conference I attended years ago.) There was discussion about reading this poem at my grandpa's funeral, but we already had plenty of great stories to share during the service. On Friday, I paused for a moment in my workday to read the poem. Usually I am so wrapped in the things that I am not doing, that I forget about the things I am doing. I worry that I am not exercising enough or cleaning my house enough, but nobody else is going to remember these parts of my life. People don't base eulogies on how clean your house was or how organized your files are or if you exercised thirty minutes everyday. It is about how you treat the people in your life; that is what is important. I am not 100% sure who I will vote for in the Texas primary on March 4, but this election is turning out to be more interesting than I expected. A friend forwarded me the link to this video, which I love. It is so refreshing to see a positive message out there during an election. Here is the full speech. 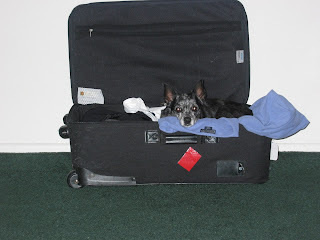 Maybe Frida was thinking, "Next time you go on a trip, take me with you"! 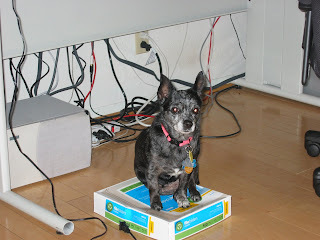 Or maybe Frida just likes to sit in and on our stuff. Did you notice the new banner at the top of the page? 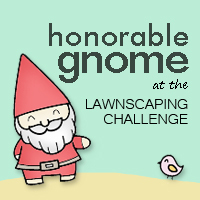 I designed it in Photoshop Elements! It is pretty basic, but I have to start somewhere. I want to design some new banners for the website at work, so I am playing here first. It was 1929 and my great-grandmother, Christina, was a 25 year-old widow with three young children. She was advised to give up her children for adoption but refused. My grandpa was only five years old when his father, Wilson, died. My great-grandmother raised her children through the Great Depression. She did not have an extension education, but she used her skills, such as sewing, to survive those lean years. My grandparents divorced in the mid-sixties, when is certainly was not the norm for parents to divorce and the father to have custody of five children. (My oldest uncle was over 18 and in the Navy.) My grandfather dated Joan for seven years before they got married. I never knew why they dated so long. They both had children at home and realized that it was not best to blend the families. My grandpa waited until my aunt (the youngest) was out of high school before they got married. To me, Grandpa and Ma Joan were my grandparents. I knew that they were happy together, but I never realized that she was the love of his life. Now they are back together, 17 years after she passed away. I arrived in Ohio on Wednesday afternoon to prepare for my grandpa's visitation on Thursday and funeral on Friday. In the late afternoon on Wednesday my mom and I went to my aunt's house to help her with the pictures. My grandpa was an avid photographer, so there are boxes and boxes of pictures and slides. There are pictures from Europe during World War II, my grandpa and grandma before they were married, my mom and her siblings as children, my grandpa and step-grandma on their many travels, hunting trips, fishing trips, and my cousins, brother, and me. My 17-year-old cousin has really developed his talents as a photographer and film maker. He made a picture slide show set to music to be shown at the visitation. I helped select meaningful photos to attach to foam boards for display. This was where my scrapbooking knowledge came in handy. We needed a safe, removable adhesive to use on vintage photos. After using over 200 glue dots, the foam boards were complete. This was a cathartic process for us. Looking through the old pictures brought out some stories that I never heard about my family. We were able to cry together and keep working through the grieving process.